While most car buyers go for the standard silver, white and black tones, small car buyers are being much more adventurous. Rankings of the most popular car colors are generally fairly conservative. Whites and grays make up the top of the list. But, for some reason, small cars -- and especially very small cars -- tend to steer their own course on colors. On tiny cars, loud, odd-ball colors are the rule. 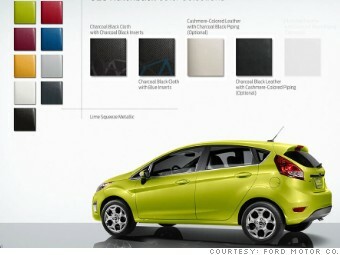 There are a few reasons that colors like "Lime Squeeze," on display here on the Ford Fiesta, are popular in petite cars, said Nancy Lockhart, color marketing manager for DuPont's automotive coatings divisions. Second, bright colors tend to look better in small doses. A color that might seem garish on a large car can be tolerable and even fun on a tiny car like the Fiesta. And third, said Lockhart, these small cars are usually new to the U.S. market, even ones from Detroit brands like Ford and Chevy. So they're carrying with them color schemes that were popular in their original home markets of Europe and Asia.